Two of our amazing volunteers, Jill and Don McLaren, scooped the Volunteer of the Year Award at the Association of Air Ambulances’ Awards of Excellence 2017 – an event attended by over 300 people. 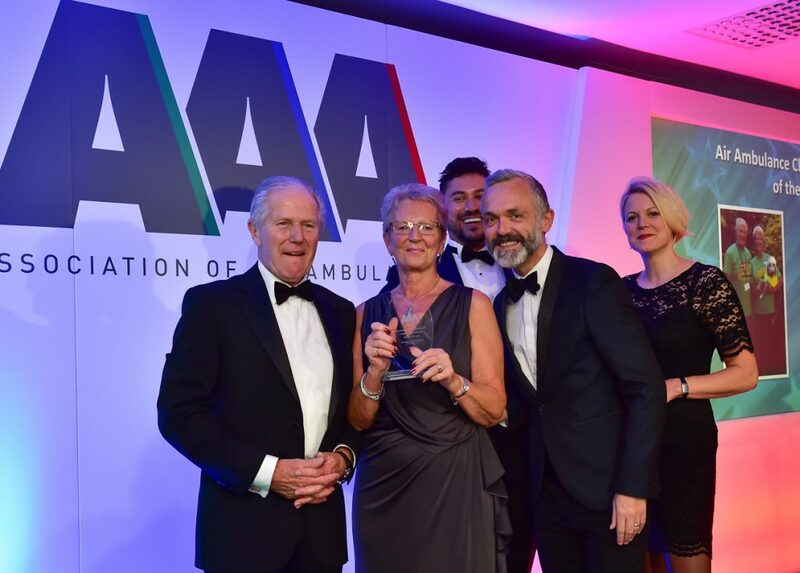 These prestigious awards recognise the very best of those who work tirelessly for air ambulance charities, from amazing crew and staff members to fantastic volunteers and fundraisers. Jill and Don were up against stiff competition, with 21 UK air ambulance charities represented at the event, from Devon up to Scotland, but it was the couple’s commitment and dedication to our Charity that stood out. In 2001 Jill and Don’s life was turned upside down when their daughter Alex was involved in a road traffic collision as she returned to Nottingham for the weekend while away at university. The couple immediately made their way to the Queen’s Medical Centre, but unfortunately, Alex’s injuries were too severe, and sadly she later passed away in hospital. The following year the couple visited our operational base and discovered that the fact that Alex had been airlifted to hospital by our Ambucopter had given them time to say goodbye to their daughter rather than to receive a call saying that she had died at the scene of the accident. But, this was only the start of the McLarens’ involvement with our Charity. Over the past 16 years they have raised over £30,000 by taking part in a sponsored cycle ride for 10 years, money that has helped to fund many potentially life-saving missions across Lincolnshire and Nottinghamshire. They have also donated in excess of 8,000 hours of their own time as volunteers, undertaking many roles including sorting donated items for our shops, manning stalls at events and giving talks about the Charity. As a Charity we rely on our army of dedicated volunteers who all play a vital part in ensuring we can continue to save lives for many years to come. Jill and Don ware a great example of volunteering at its best and we are extremely proud to have them as part of our team.